Color chooser works well, but alpha/transparency value on it, won't. Select style of preference and click on Customize Settings button. 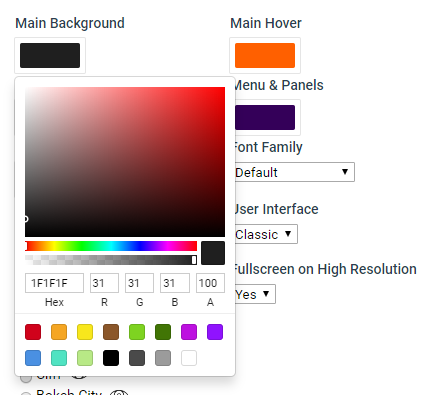 Select a color variable, it will open up Color Chooser. On Color Chooser, try to move the transparency slider and/or typing custom value on Alpha input. When trying to move transparency slider you can't, it seems disabled. If you enter a value on the Alpha input below, when focusing out automatically returns to default 100 value. Color Chooser sets up correctly the desired value through transparency slider and/or typing a custom value on Alpha input. I wonder fixing or enabling this won't take much time and will be of valuable utility for many of us, users and editors. This has been discused before but I hope some Admin could fix the problem, or remove the transparency/alpha value if this feature can't be implemented. Thank you! Bump it all you want, they literally couldn't care less about bug reports.